Winter begins as a raw and desolate state of change in the Southern Hemisphere, short days coupled with bitter cold nights invites only the brave to weather its fury. Much like with fire, it takes stoke to build energy and with stoke we came. Our winter started within the early days, a low tide start to the season prohibited us from entering a lot of desired locations and halted the opening of many of the club fields. This called for a restructure in our approach to the first weeks and one that, with a little bit more mahi (Māori for work), came plenty of treats. Eventually the snow returned in droves from regular North West low-pressure cycles and the season began to kick off. Snow building within the divide of the Southern Alps and scattered weather fronts slating their way across and dissipating into the east. The plans change again as the season turns. As the months turn to spring and the days begin to stretch, the opportunities grow. With warmer days come more positive vibes and the snow turns from powder to corn. This a critical time in New Zealand – it’s a time to reflect and to share with friends, to discover new and foreign areas presenting opportunities for seasons to come. Pictured Left: Ben Comber holding fast to a method, the wind scarred West face visible behind the ridge. Right: Kenji Boekholt tip-toeing along the Olympus ridgeline with the Harper and Avoca rivers below. PC: Ben Comber. 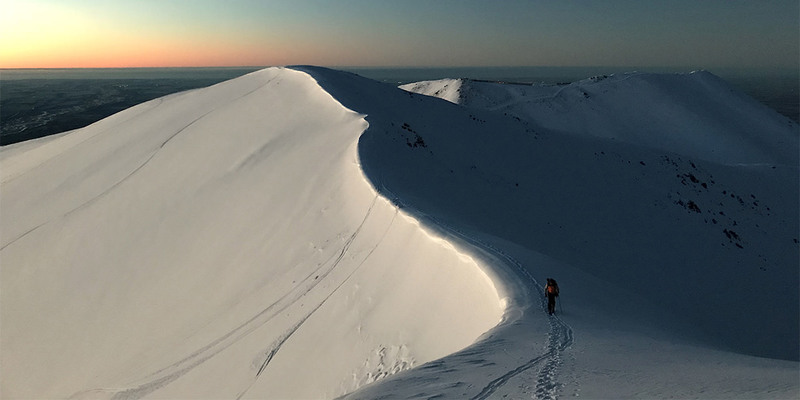 Those who have endured and experiencing the empowering satisfaction of the Southern Alps will never detest the bitterness of New Zealand winter, as it crafts us into the characters you see scattered within the mountains, and if you can’t hack it, there’s plenty of room for you in Auckland. Download the Snowledge App to learn more about our ambassadors, including athlete profiles, more incredible photos, maps, and weather from each mission such as Hunt for the Powder People, our film to New Zealand with Ben and Alex.